I've started yet another project. My justifications are simple, while my daughter was home I went through my extensive shawl, scarf and cowl collection and gave her the ones that I wear infrequently. We both agree that one way to add life to a wardrobe is with accessories. Some I gave freely and some I said "you are borrowing this one". Whether she owns them on not, I declared that I will tend to their washing. Anyways, this shawl is the Pendulum Shawl and the pattern is quite easy, as in TV watching easy. Well TV watching that talks a lot. If you are watching an action movie you're better off not knitting at all. For wool, I chose Malabrigo Sock-so decadent to handle :) My ravelry notes are here. Yesterday I posted about my finished hat which I cannot wait to wear. In our front yard the maple leaves are starting to drop, so I know hat wearing weather is just around the corner. My favorite aunt lent me the book I'm reading quite a bit ago. I thought I'd read it so I can return it to her when I see her in the fall sometime. I've just started and have no opinions as of yet. I feel like I'm in a reading lull at the moment. I didn't enjoy Here on Earth by Alice Hoffman and that saddens me. I just purchased a new book by Lisa Shroyer, "Free-Spirit Shawls: 20 Eclectic Knits for Every Day". Beautiful shawls, beautiful photography with fresh interesting patterns. I would highly recommend. You are such a good mama Karen to lend your knits and I love that you have retained control of their bathes, you are so funny. I am in a reading slump myself and hope to find a good book soon. I'm a little tired of reading chemistry. Lately I've found it easier to listen to a book than to pick it up and read. I go through phases. Shawls are my favorite thing to knit. It's fun to mix it up between lacy and garter, easy and complicated. A shawl can be worn by anyone and they're always appropriate. Oh such a pretty shawl!! Your daughter is very lucky that you are so generous with your knits! (I'm planning on knitting Ree a Boneyard shawl for Christmas. She keeps taking mine. I want mine back!) I keep eyeing that book at the library but haven't picked it up yet. I'll be interested in seeing what you think of it! I love Jodi Picoult's books! You are a wonderful Mom for gifting some shawls and scarfs to you daughter! Love the start of the shawl. And your wurm hat is adorable! My girls like to go through my scarfs and where them all around the house. What a lovely shawl - the color design is really pretty! I love your color choices. I've never given away a shawl because I don't think most people want to hand wash and block them. You are wise to take care of that part. I've read one Picoult book and it was pretty good. I love the color combination- brown and blue are on the list of favorites. Your daughter must be so happy to have a knitting queen for a mom! I also love the Wurm hat you made and the mix of colors...very pretty. Your daughter is very lucky. Would she wash them right if you walked her through it? I love Jodi Picoult books but I really have to be in the mood for one. Beautiful shawl! And malabrigo... I'm knitting a scarf with malabrigo right now and savoring the feel of each stitch. That's a good idea though, about tending to the washing. I've done that for things i've given my sister as gifts. Leaves falling already? Wow! I need to pay closer attention and see if we have any falling here! how fun! so nice to be able to share things! Looks like a lovely new knit! oooo! I really like that brown and blue combo. Nice! It's sweet that your daughter actually wants to "borrow" some of your knits; my oldest girl? Our styles are so different, but the younger one still appreciates some of what her mama likes. :) And how very sweet of you to gift/loan from your accessory stash! I just can't have enough shawls! It's nice that your daughter will wear them. I may knit one for mine for Christmas for once. It's a lovely shawl! I can't believe your leaves are ready to fall already - they're not even changing colour here yet but that's just fine with me for the time being - I'm too busy and when Autumn finally arrives I want to immerse myself in it. Love Malabrigo sock! And love those colors together. I feel like I'm seeing a lot of Picoult on the yarn along lately. Love the brown and blue together. 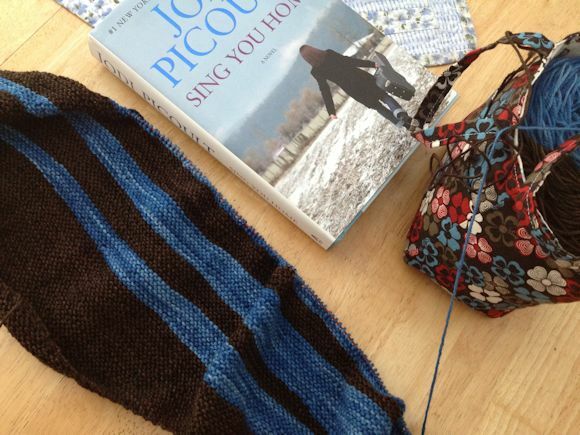 I am knitting fingerless mitts and just finished reading The Secret Life of Bees...so good. The colors you chose are stunning together. And an easy to knit with television on pattern is right up my alley! I hope this lull in reading is temporary as you enjoy it so. But a bad book can certainly take the wind out of one's sails, can't it?! Your daughter is a lucky one! Hurray for sharing accessories with your daughter. You new shawl looks great, I do so love stripes! Love that blue shawl! I just finished reading V Is for Vengeance, and you've inspired me to get a Jodi Picoult book off my shelf. Thanks! I love the shawl and also the striped hat in your last post. I am deep into non-fiction this year - have read only two fiction books all year. Currently reading Hold On to Hope because we are dealing with the addiction of a family member. Before this is was Parenting Teens with Love and Logic. I'm afraid the challenges of life have impacted my reading this year. I think I will seek out a good fiction read and relax and take a deep breath soon. i wish our leaves were beginning to change and drop. is it a bit early for you or right on time? What a fantastic sharing. Yes, accessories can really change the look of an outfit - kind of like buttons on a sweater. Lovely yarn choice too -earmarking that pattern. And leaves dropping - oh my! We have a big trip to MI planned for November. I know we will miss the leaves, but D's family promises to save us a few. Still in the 110's here. Hi I'm back and catching up with all my missed blog reading. I love your mention of indulgent beginnings to the day. A great idea. I'm having one now reading this and I would knit at the same time, but I've just done too many rows of the pattern so a little unravelling is in order. The mittens for your daughter are gorgeous, pretty pattern and I love the colour. Lucky girl. And your hat is awesome. I loved the last Dr Who too. He's the only Dr Who I really liked but I missed most of it so like you might have a go at re-watching. My reading and knitting? I just started a lala shawl. It's so easy to do and I'm reading 'Things I've Been Silent About' by Azar Nafisi. It's very interesting and insightful. I'll hopefully write about it for next weeks Yarn Along.